Do you want to teach your child about the exotic animals that live in South America? Are you looking for some fun activities to improve your child’s knowledge and motor skills? Well, then you have come to the right page! Llamas are wooly animals belonging to the camel family. People domesticated llamas thousands of years ago in the Andes Mountains of South America. Even today, the natives raise these animals for their meat, hide and wool. 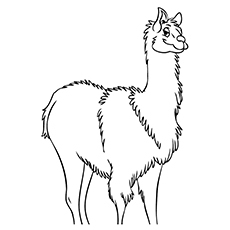 Now that you’ve gained enough knowledge about llamas go ahead and enlighten your child while he enjoys these llama coloring pages printable in different moods and poses. We have both simple and complex images, suitable for children of all ages. Do you want your child to learn the alphabets in a fun way? 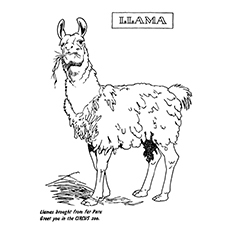 Then here is a perfect worksheet L for Llama coloring sheet for him. 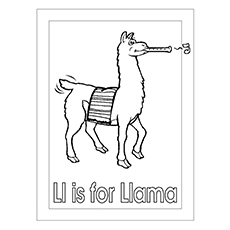 You can also ask your child to name other things and animals beginning with the letter L. Do you know that llamas produce a humming sound to pronounce their territorial dominance? Share some fun facts with your child as he colors the page. 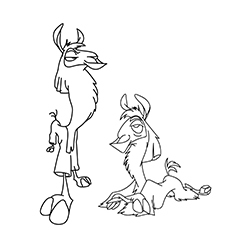 Here is a coloring image of Kuzco, the emperor who became a llama. Kuzco was the protagonist of the film ‘The Emperor’s New Groove’. He turns into a llama when he drinks a magic potion that Kronk offers him. 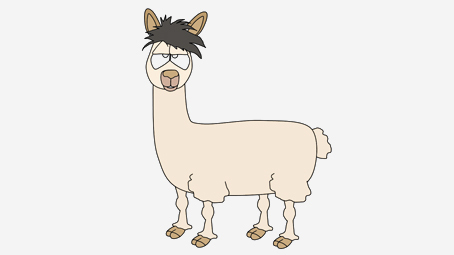 Here is a cartoon image of a llama. But why is it so sad? Perhaps, a few strokes of vibrant hues will cheer it up. We would recommend your child to use multiple colors to paint this page. Alternatively, your child can also stick strings of colorful wool on the sheet. 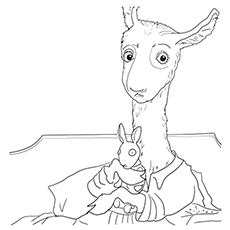 Here is a coloring sheet of mama llama with her baby. The scene is from a bedtime story book, ‘Llama Llama Red Pajama’. It is for children who face trouble while sleeping. The coloring sheet will surely make your child giggle. 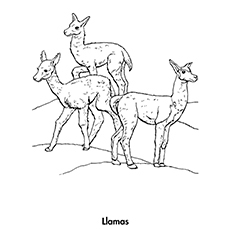 Here are not one, not two, but three llamas for your child to color. These are Ccara llamas, the most common species of the animal. The Ccara llamas have short to medium length fleece on the body and very short fleece on the legs. 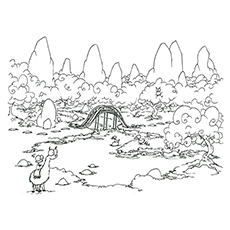 Here is a coloring sheet of a hungry llama munching on some grass. The animal you see here is a Tampuli llama. It is a furry llama. In this coloring image, you can see that the coat of a Tampuli llama extends down to its legs. The unique feature of this llama is its wooly topknot. The llama here seems to be thinking hard about something. But what could it be? Is something worrying it? Or is it just admiring the beauty of the incredible landscape? 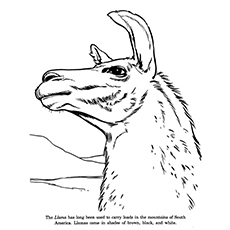 The coloring page also includes some facts about llamas. Tell your child to read out the facts before coloring the sheet. Here is a finely detailed coloring sheet for older children. The coloring sheet shows a monkey riding a llama. The backdrop is also incredible. It has mountains, trees, birds, a bridge, a river and a few ducks. Tell your child to paint this sheet using watercolors. Help him create a masterpiece that you can proudly display at home. Here is a coloring image of a wooly llama. The wooly llama, as the name suggests, has a thick fleece all over its body, especially on its head, neck, and ears. Tell your child to draw a snow-clad hill and some greenery to give it a beautiful South American backdrop. 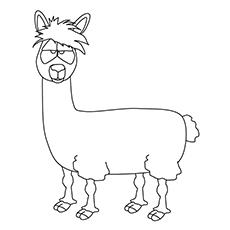 The coloring sheet shows an adult llama. It has long, rough guard hairs protruding from its fine undercoat. These llamas are popular as beasts of burden across the rugged terrains of South America. 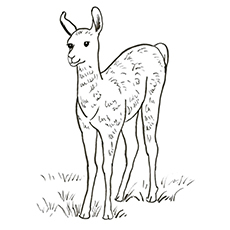 We hope your child enjoys these free printable llama coloring pages while he learns more facts about llamas. Do not forget to tell us your child’s favorite coloring image from this series in the comments section below.